I thought that I would describe the work I have done with the camp vermicomposting bins, and share what I have encountered so far. 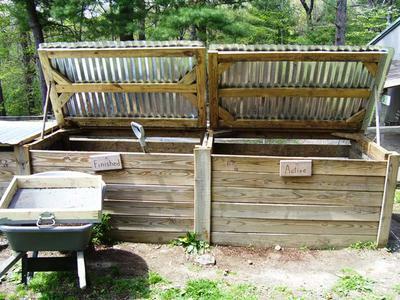 We have an outdoor 3-bay wooden composting setup. Each bay (bin) is approx. 4ft x 3ft x 4 feet deep. Each bay is separated by a removable frame that has 1/8" hardware cloth, which allows for migration between each bay. The bin has removable fronts for cleaning/emptying, and each top is a hinged wooden frame with metal roofing attached. The back side of the compost bins are vented with 1/8" hardware cloth at the top, middle, and bottom. The entire frame is set approx. 4" into the earth, and has an open bottom for drainage. The bins are not insulated in any way, and are exposed to heat and cold extremes. When I started working with the compost bins in 2008, they had not been very well cared for, yet the few worms I found inside seemed to be doing well despite their living conditions. Contained sticks, wood chips, pine needles, leaves, and a little bit of food that had been mostly composted. The bin was approx. 2/3 composted. I separated the worms from the bin materials, screened out the finished compost, and removed all of the pine needles, hard wood and other woody materials. I placed fresh bedding materials (shredded newspaper and cardboard), semi-composted food from the other bins, and leaves in to the bin, added all of the worms I found in the 3 bins and started fresh. 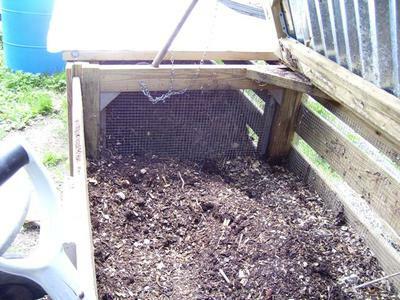 Was filled with completed compost and a mixture of unprocessed wood chips. I screened the wood chips out, and had a medium sized wheelbarrow full of finished compost, very nice, clean, and rich with a wonderful, earthy aroma. This compost went into bin#3 to cure. Contained wood chips, sawdust, leaves, sticks, and some decomposing veggies. I cleaned this bed completely out and placed all of the finished compost into it to cure out. A local worm farm provided us with a mixed batch of bed-run red worms and red wigglers, approx 5 pounds plus cocoons. I added them into bin #1, along with 2 18-gallon tubs of kitchen scraps and a 2-30 gallon trash cans of brown, semi-composted leaves. I checked and watered the bins 2-3 times a week, and the staff added small amounts of fresh food waste daily. The bins are producing a large wheelbarrow of fresh compost every 4-6 weeks, and the worm population is constantly growing. The staff add food waste every day, and add paper and leaves as needed to keep a proper mix of brown/green. I can't tell you the exact amount, but I do estimate we have around 50,000 - 60,000 worms working. 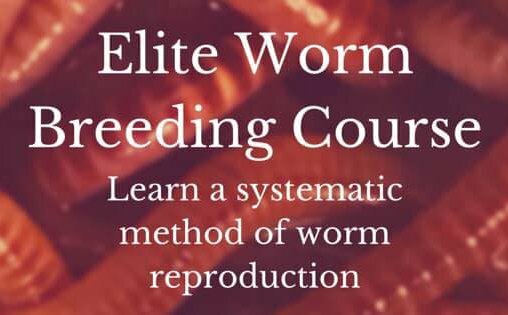 Even after a particularly cold winter we lost very few worms, and the population is very healthy and active. The system is used to enrich our gardens and landscaping, and we teach Environmental Education students about the value and importance of vermicomposting and reducing waste. Thanks Robert, I love the fact that you can pull any side off (front, middle pieces & top). It makes it very practical to get to. Also, having it a few feet wide and high makes all the difference in the world when trying to keep the worms warm or cool. Thanks for the nice comment, and for allowing me to share. It is greatly appreciated!!! 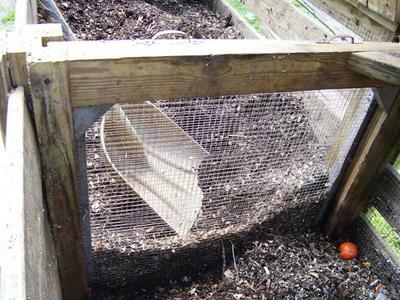 "The back side of the compost bins are vented with 1/8" hardware cloth at the top, middle, and bottom." Mike, if you look at pic #3 (interior shot)you will see the back panel.....used 5/4 decking boards and spaced them about 3" apart. You have a great system there. I like the way you utilize the three bins. Because of the massive size you get away with the metal lid not heating up the bins I suppose. Size is the only draw back I see in your system for the average non commercial worm farmer. But I see where your system could be scaled down for someone with DIY skills. With a little creativity one could make one bin at first with the idea that another attaching bin would follow and so on, keeping the initial expense low but still get started worm farming quickly. Then add the second and third bin later. I can see where your system could inspire "would be" worm farmers to dive in and get going Vermicomposting. Teaching is an admirable thing you are doing...I applaud you for it. I love this system. This is my dream system, though when I get the chance to build one, it will be much smaller, as it will also probably have to fit into my next apt, which will be a one-bedroom. But, I like that with horizontal migration, you don't have to pick up trays with holes in the bottoms of them, with castings and worms hanging down everywhere, lol! Since I have my worms in my apt, this always sounded like a messy indoor job. But, with the horizontal migration method, it would be a cleaner indoor job. Thanks for the positive comments...they are greatly appreciated! Robert, you wrote: the bin compartments are separated by removable 1/4" mesh screen panels. When I make my bin system I hope to make it as simple as possible. Why did you make the mesh removable? Thanks for the great design and your willingness to help new folks like me. Great question, Gregg. The removable screens aid in cleaning out the bins, or can allow for 2 bins to be combined into one large bin for larger amounts of composting material. In my years of working on this system, I have only removed the separation panels twice to completely clean the system out. I believe he designed it to be removable for easy access to all parts of the bin. Especially during harvest time to be able to shovel and move things around. It is also a great idea to make everything as removable as possible in case it needs to be moved to a separate location. Portable Outdoor Womr Bin ? How about portability? It looks easy enough to break down and relocate the system. Pauly, it is entirely possible....this one is anchored into the ground for stability, but it could be easily disassembled and reassembled. The corner screws can be removed and separate the sections, the tops are held on by 5 screws per side, and the back panel is a 2-piece. yeah, it could totally be moved!!!! How cold does it get where you are? In winter, we average night temps in the mid 20's....we get some low teens down to zero, but they are few. Most days we average low to middle 30's. Do you guys have fire ants in North Caroline? If so, how do you keep them out of the bins? Laura, we do have them, but so far I have not had any problems with them getting into the bins. Keeping the moisture content up will help....ants generally stay away from moisture, and tend to prefer drier conditions. If you start having problems with ants, try wetting down the bins (not too much) and wet down the ground 3' - 5' around the bin area.....that should help keep them under control. what kinds of Worms are you propagating African night crawlers or something else? how do you avoid rats from feeding on your kitchen rest? Could you describe where you are located and what kind of temperature extremes your system experiences. I am in Canada and am looking for something like this that would work for me. Thanks. Let me first say that I no longer work with this system, as I have d left the camp. The average temps in our region vary from -10 F in the dead of winter to low 90's in summer. The worms weather it well, as long as you provide plenty of protection in winter. I packed the beds in late Fall with straw and leaves, and re-pack about every other month. The heat does not seem to affect them, as long as you keep the beds moist. Good luck with your system...I really enjoyed working with this one, and am looking forward to building a similar setup at my new location. This is NOT a flow through system. It is a side migration system. 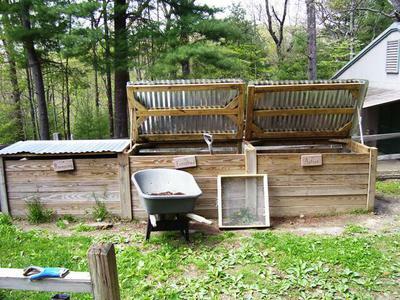 This is a Horizontal Flow-Through Vermicomposting system. 2. A Continuous Flow-through which usually has a false bottom. Undoubtedly you will run across MANY people calling systems whatever they want to on the Internet. However this is generally what they are. The horizontal flow through system is designed to work just like a vertical....once the initial bin has become mostly composted, you will start adding new bedding material and compostables to the bin next door. The worms will migrate to the fresh bedding/food. When you harvest the compost, it should be mostly worm-free. You may have to separate worms manually from some of the compost, but this should be a quick process.